Nothing like a last minute party. 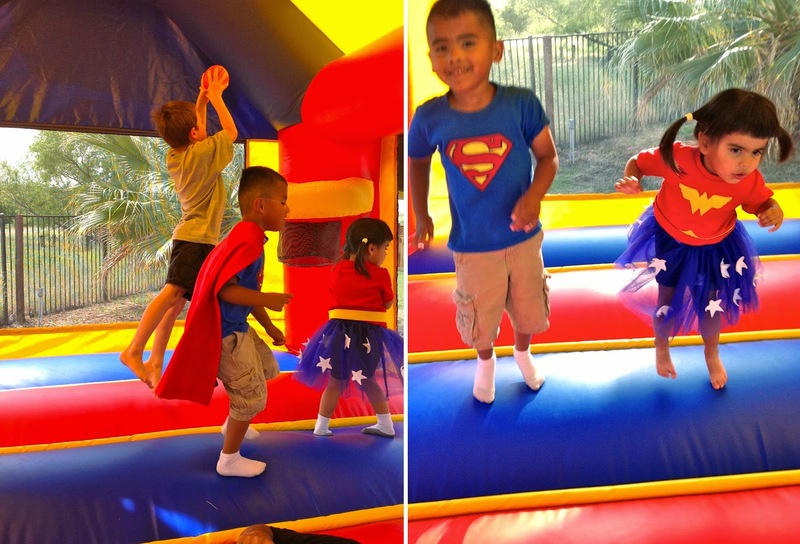 Since we did a big party last year for Johnny’s 4th, we weren’t gonna do a party this year, but we caved last minute and decided to do it since all Johnny really wanted was a bounce house. 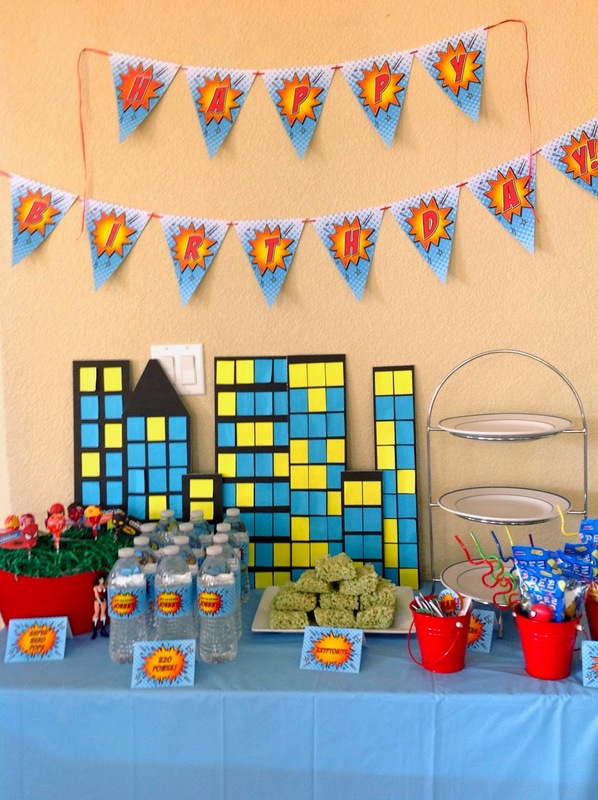 I have to admit having a smaller party and planning it in about 5 days was much less stressful than the usual weeks of thinking, planning and designing. So, as I usually do, I start with a theme. Johnny and Mia are both into super heroes right now. I can’t even count the number of times we’ve seen Spider-Man and Superman. 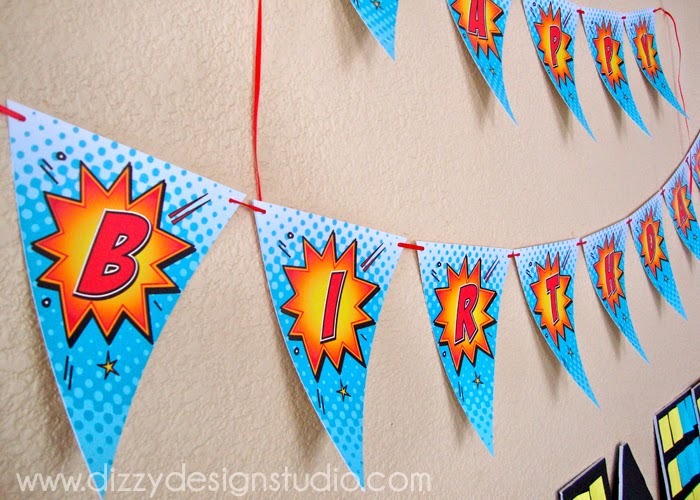 I already had a few party items in the super hero theme, so that eliminated designing something from scratch. 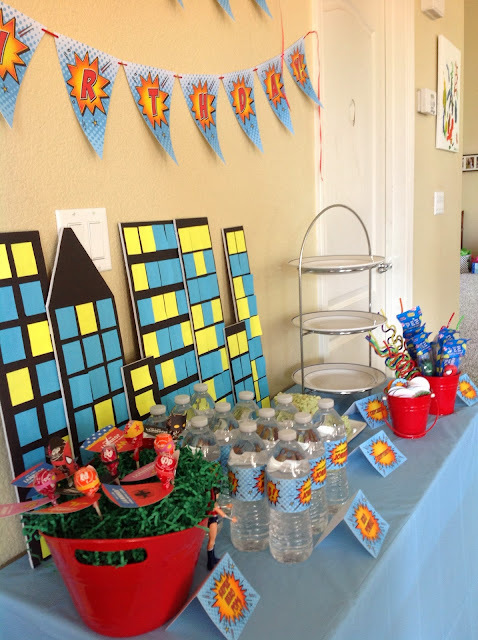 I love DIY projects on the cheap, so I have to talk about my city scape back drop. While I was picking up some party supplies at the dollar store I bought 1 sheet of black foam core board, a pack of post-it’s and some sticky foam squares. I cut up the foam board width wise at different widths and basically assembled them together with foam squares, stacking the squares to give it dimension. Apply your post-its for windows and viola……city scape! 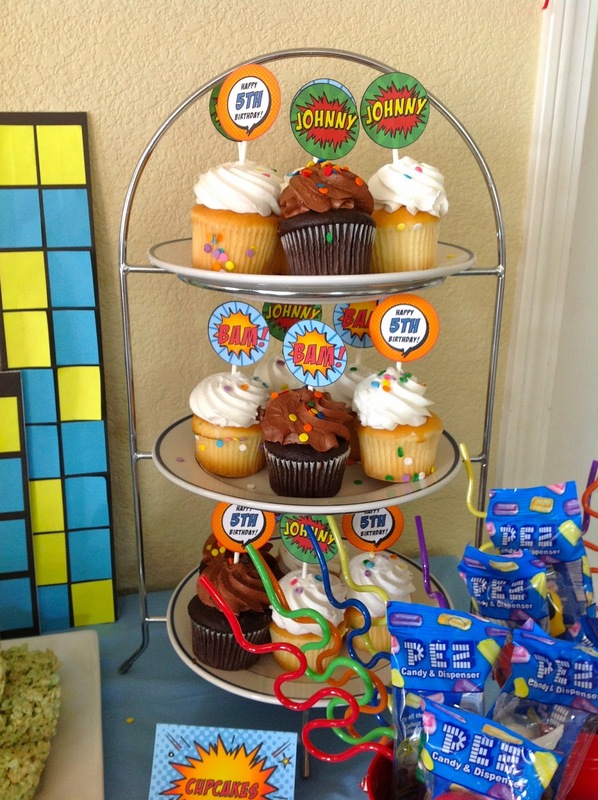 I set up my desert table with all the personalized paper goods and other party favors and treats. 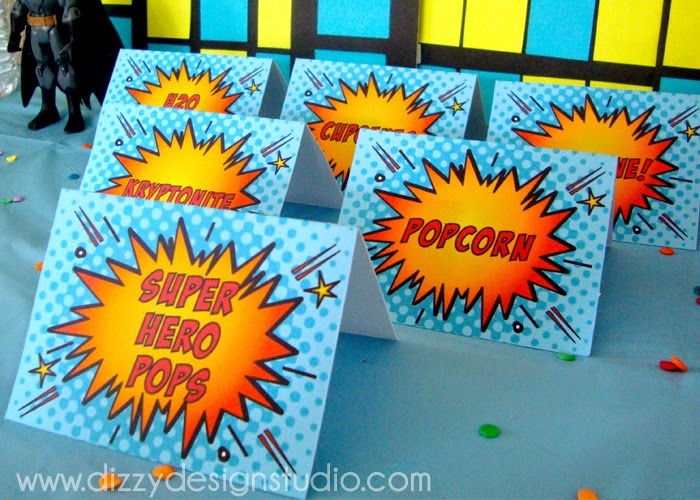 I had lollipops with personalized masks and capes, Pez super heroes (a great last minute find), cupcakes adorned with personalized toppers, and my favorite, green rice krispy treats which were cleverly labeled as kryptonite. 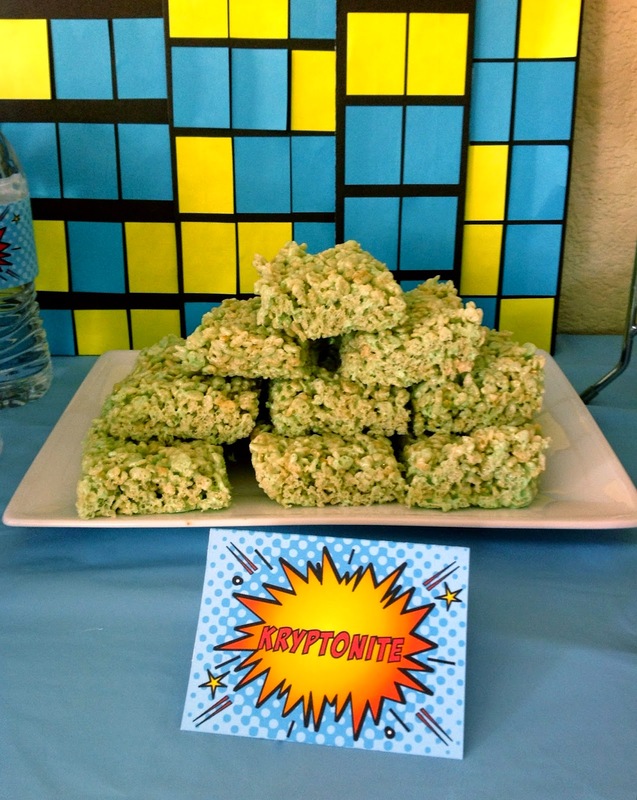 So easy, just add some green food coloring. 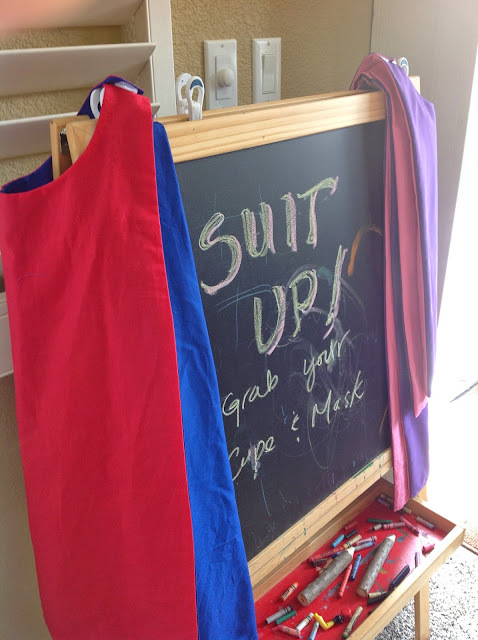 The kids had a blast in the jumper, capes flowing and all! Success. 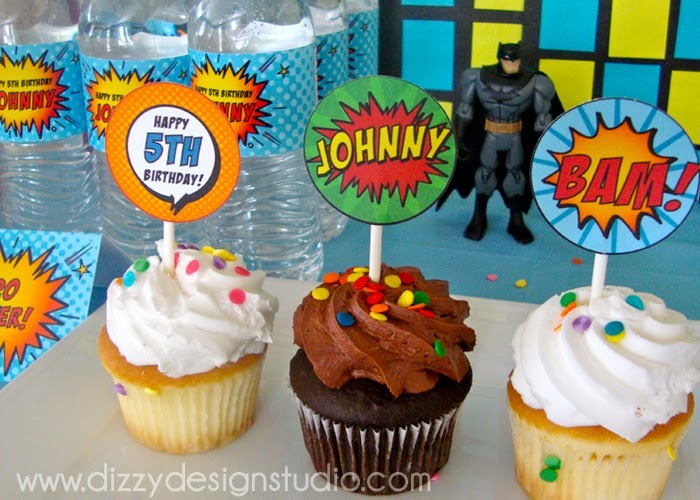 Find all my super hero paper goods, including banners, water bottle labels, food labels, lollipop super hero favors and cupcake toppers, on my Etsy site. Hi Luis. 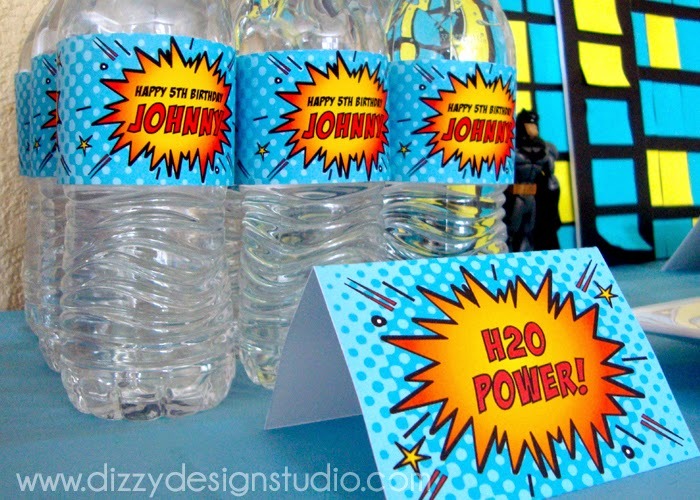 The labels are applied simply with double sided tape.